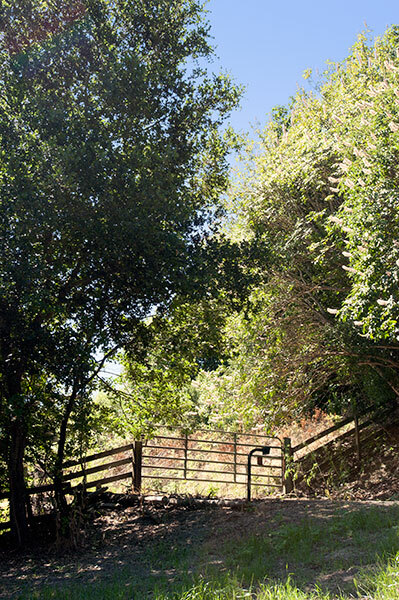 The gated entrance to Adobe Lane. In 1835 Don Joaquín Moraga, with his cousin Don Juan Bernal, was awarded this grant which they called Rancho Laguna de los Palos Colorados - the adobe was completed in 1841. Don Joaquín was the grandson of José Joaquín Moraga, founder and first commandante of the Presidio of San Francisco. The Joaquín Moraga Adobe is privately owned and located on fenced property. It is not visible from any public right-of-way. We were unable to locate a commemorative plaque. The Joaquín Moraga Adobe is also National Register Listing 72000223.